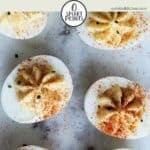 These Devilled Eggs (or Deviled Eggs if you are in the US 😊 ) are a Weight Watchers dream! They are Zero SmartPoints per portion and taste divine! They are one of the easiest things to make and can be enjoyed for lunch, dinner or for a tasty snack any time of the day. Devilled Eggs are hard boiled eggs that have been shelled, cut in half and filled with a creamy egg yolk and mayonnaise paste. They can then be garnished with a pinch (or two) or paprika and some chopped chive. They are a real throw back to the 1970’s, where no dinner party was complete without a platter of Devilled Eggs being passed around with the Babycham! Although, they have never really fallen out of favour in the US, for some reason they did in the UK. But they are now becoming a UK firm favourite again. I wonder if Babycham will do the same?! And they are a particular favourite of mine, especially since starting on my WW journey. They are so easy to throw together. Perfect for lunch or to have for a filling, zero point afternoon snack. Using the ingredients that I have specified in the recipe, you can have 2 eggs (so four halves) for zero points – how good is that! Cover the eggs with cold water (pic 1) and bring the water to the boil. Once boiling, turn down the heat to a simmer and cook the eggs for 7 minutes. As soon as the 7 minutes is up, drain off the hot water and run them under cold water for a couple of minutes until they are cold enough to handle. Hard boiled eggs can be difficult to peel! Often you find that the shell breaks into lots of tiny little bits which makes peeling them a real chore. To prevent this there are a couple of things that you can do. Firstly, make sure that you run cold water over the cooked eggs. Missing out that step means the eggs can be more difficult to peel. Secondly, don’t use fresh eggs! Older eggs seem to be easier to peel (something to do with their pH balance!). I’m not advocating using out of date eggs, just eggs that aren’t fresh from the chicken! I tend to roll the eggs on a chopping board prior to peeling them (pic 2). I use a little bit of pressure, just enough to crack the shell, and this tends to detach the shell membrane from the rest of the egg, making them easier to peel. 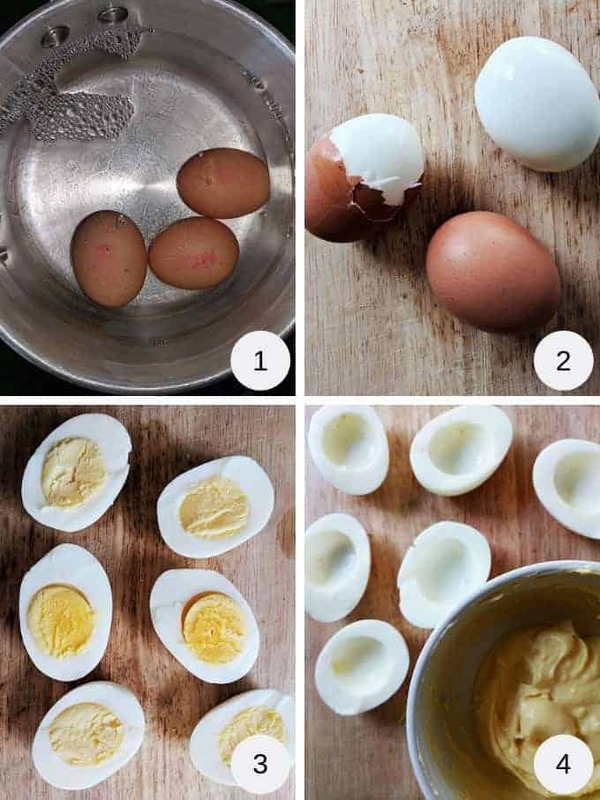 Slice the eggs in half. You can do this length-ways or width-ways! If using the instructions above to boil your eggs, you will get a yolk that is firm but not so firm that it’s powdery (pic 3). Remove the yolks from the whites and place in a bowl with the rest of the ingredients and combine until nice and smooth. You can either use a spoon to fill the eggs or if you are feeling fancy 😉 , use a piping bag with a star nozzle fitted. Sprinkle with a little paprika and some chopped chive. These Devilled Eggs will keep well in the fridge for a couple of days, although if you have piped them, they may lose a bit of definition. 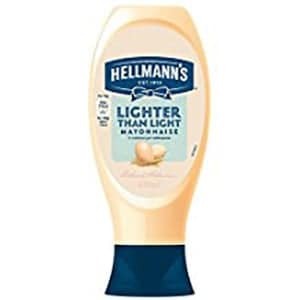 I used Hellmanns Lighter than Light Mayonnaise in this recipe. If you are in the US, you could use Kraft Fat Free Mayonnaise. I used Colman’s Mustard Powder in this recipe, available from Amazon. Use Hellmanns Light Mayonnaise and 2 eggs (4 halfs) would be 1 SmartPoint. Use Hellmanns Real Mayonnaise and each egg (2 halfs) would be 1 SmartPoint. 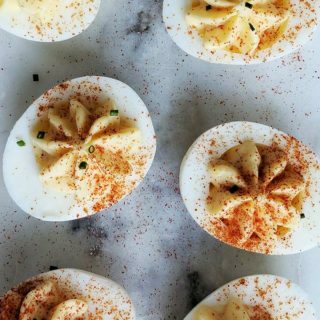 Swap the mustard powder for curry powder to make curried Devilled Eggs. Used chopped parsley or dill rather than chopped chives. 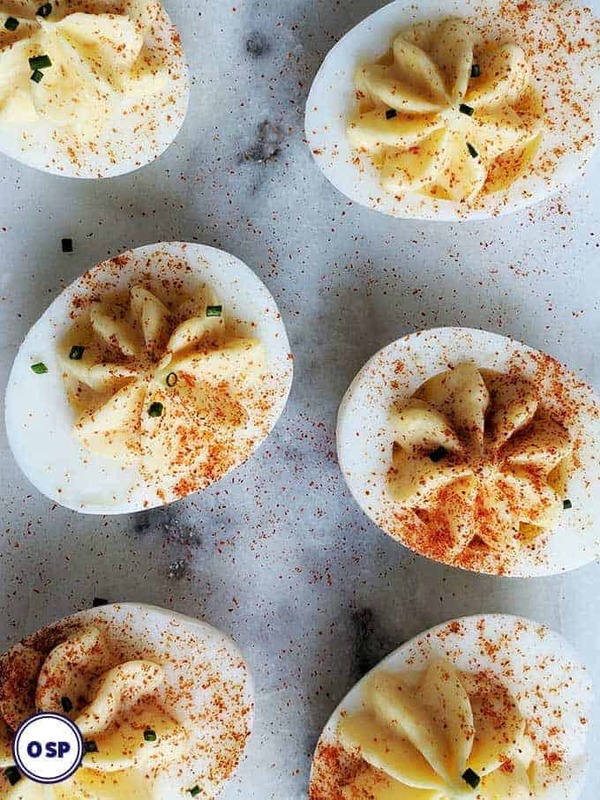 These Devilled Eggs are zero SmartPoints per portion on Weight Watchers Freestyle Plan. Place the eggs in a saucepan and cover with water. Bring the water to the boil. Once it reaches a boil, reduce the heat so that the water is simmering and set a timer for 7 minutes. Once the timer goes off, remove the saucepan from the heat and drain off the hot water. Run the eggs under cold running water for a couple of minutes until they are cold enough to handle. Peel the eggs (see tips in post) and slice each egg length-ways. Remove the yolks and place them in a small bowl with the mayonnaise, mustard powder and salt. Mix till you have a smooth creamy consistency. Taste and add more mustard or salt if required. Either spoon the yolk mixture into the egg whites, or fill a piping bag fitted with a large star nozzle and pipe the mixture onto the egg whites. Sprinkle with a pinch of paprika and some chopped chives.